Start your day the "Trimmy Way" and your health and weight-loss goals will be reset every morning. Any steaming hot drink can be easily creamed the slimming Trimmaccino way. The end result is frothy and creamy. 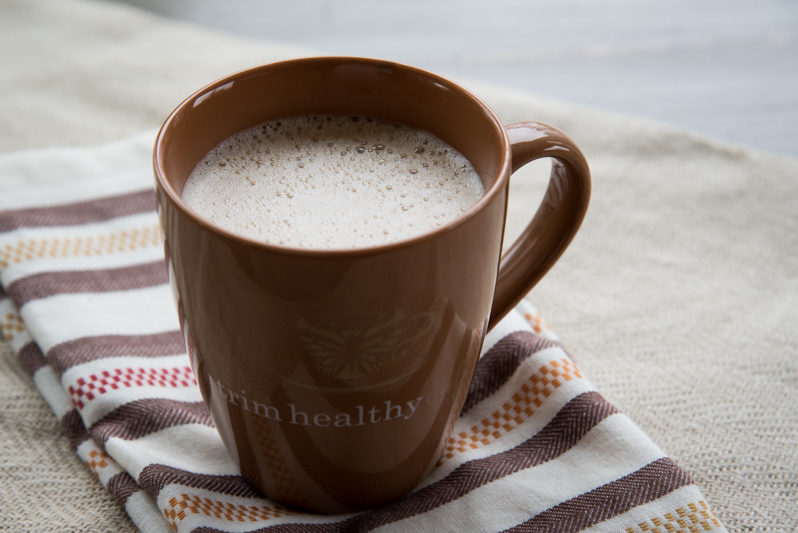 Baby step your way into the world of Trimmies and start enjoying this creamy, hot beverage and take advantage of it's slimming and healing benefits today! Place all of the ingredients, except the whey protein powder, in a blender. Hold the lid on tightly and blend for 10-30 seconds on the lowest setting. Lift lid off of the blender and add the 1 teaspoon of whey protein powder while the blender is "whirring". Turn the blender to the highest setting "after" adding the whey protein powder for about 10 seconds, or blend until frothy and deliciously creamy (or use a stick blender). *Please review and follow the manufacturer's instructions on using hot liquids in your blender, or use a tall heatproof cup and an immersion blender. Our Trimmaccino's do allow for a natural venting of steam when removing the lid to add whey powder. Make sure to start the blender on low, not high. The Basic Coffee Trimmy and the following versions can be found in the Trim Healthy Mama Plan Cookbook. The Basic Coffee Trimmy recipe and other delicious THM recipes can be found at www.TrimHealthyMembership.com and you can also watch Serene and Pearl make this recipe by tuning into THM TV - "In the Kitchen". Look for the title "Trimmy Therapy" to learn more about the "Trimmy" and how to fill your tummy with all of the warm, soothing goodness that comes from having a Trimmy every day!